Rick Yancey's alien apocalypse in The 5th Wave is one of belt, braces, and superglue. An advanced alien race has arrived in a vast mothership, but instead of wanting to talk, their first move is to try to exterminate the human race. They do this in successive waves, each deadlier than the last: an EMP, followed by a tsunami, and then a plague. 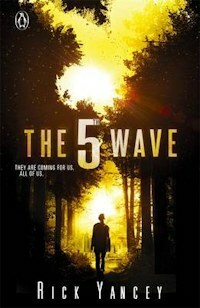 In the fourth wave people have turned against each other, because some of them don't seem to be really human, but it's hard to tell who is on the wrong side. Cassie Sullivan is hiding out in the woods and trying to survive on her own, but she made a promise that is drawing her back towards the remnants of civilisation, against her better judgement. Cassie wishes she could go back to being the average girl she was pre-invasion, because she doesn't like the way the crisis has hardened her. On her journey she meets Evan Walker, who helps her out of a fix. But she doesn't trust him, or her feelings towards him, and at every opportunity she suspects his motives and wonders about who he is. Have the aliens destroyed her ability to trust anyone, or is he really one of them? The other main thread follows Zombie, a new recruit for a squad of very young cadets who are training to take the fight to the alien. Basic training is brutal, and it takes a heavy psychological toll on the young soldiers. But when they're facing an enemy they've never met who possesses technology that's at least centuries in advance of theirs, what can they achieve with guns and physical training? The way the aliens look is one of the book's big mysteries, and we find out very little about them until well into the novel. This focuses attention on the survivors and their reaction to the situation, but the questions are always there in the background. That's just one of the elements that make this story very compelling. With frequent action, subtle romance, the breathtaking cruelty of the aliens, and high stakes, it's almost too intense. However, whilst the writing is taut and it's a compulsive page-turner, a lot of things about the aliens didn't add up. It's too much of a spoiler to nit-pick these in detail, but there are multiple plot holes that range from their ability to easily squish the human race at any time, to the reasons for them being on Earth at all. It all seemed to be contrived to deliver a perfect setting for tragedy, poignant teenage romance, and some last-gasp world saving. So I didn't believe in the aliens. By that I mean I believed in them less than usual for this genre, because it's a given for any alien invasion story that there will be a lot of suspension of disbelief required. The details just didn't seem sufficiently well thought through. 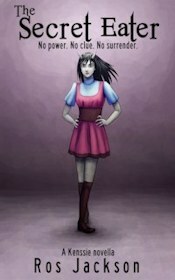 However I did believe in the main characters. Cassie has a great mixture of pluck, vulnerability , and dry humour. I loved the way she names a log "Howard", and how she thinks everything through. Zombie is less analytical, but he has his own share of issues. He's been moulded by events, and undergoes a transformation as he discovers more of the truth. Whereas Sammy, the kid brother, is credible as a traumatised yet spirited five year-old. It's these human journeys of hope, survival and indoctrination that make The 5th Wave much more than a collection of scary near-death scenes and desperate running from aliens. Another thing I should point out is that this doesn't sit very well in the YA category, in spite of the youth of its main characters. Although the romantic elements are sweet and non-explicit, there are too many brutalised child soldiers and horrors of war, and there is too much blood for that category. When the Detonations hit, those unprotected were left with horrifying mutations. The Pure inside the Dome were the lucky few. But is anyone safe and untainted in this post-apocalyptic world? London is transformed into a war zone in this chilling story of modern conflict. Vampires have overrun America. Lily and her sister Mel are imprisoned on a farm where they are treated like cattle, but a botched escape will probably mean death.